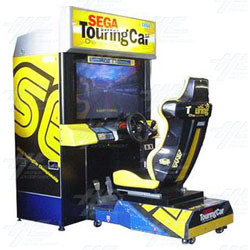 Sega Touring Car Championship is a car racing game with 4 cars and 3 tracks, automatic and manual transmissions, and alternate viewing perspectives. The three different tracks are based on difficulty level, with novice, intermediate and expert tracks available. There is also a user records feature that shows individual and overall rankings. The cabinet has two gull box speakers in the head rest and one sub-woofer under the seat. The three different tracks are based on difficulty level, with novice, intermediate and expert tracks available. There is also a user records feature that shows individual and overall rankings. The cabinet has two gull box speakers in the head rest and one sub-woofer under the seat.